On his way to becoming the eighth person in NHL history to officiate 2,000 regular-season games, Brian Murphy also worked nine Stanley Cup Finals — including two Game 7s — one Olympics and one All-Star Game. But when asked if there was one game that sticks out in his memory after becoming the second American official to reach the 2,000-game, there was no hesitation. It happened about 16 or 17 years ago, and it didn’t happen on an NHL rink. Murphy’s daughter Casey, all of 8 or 9 years old at the time, was getting ready for a house league game in the family hometown of Dover, New Hampshire, when then officials didn’t show up. Being the guy he is, Murphy stepped in and called the game. And he didn’t recall having to blow the whistle on his daughter. “She was a clean player,” Murphy said. Much of his career has taken place on a much larger scale. 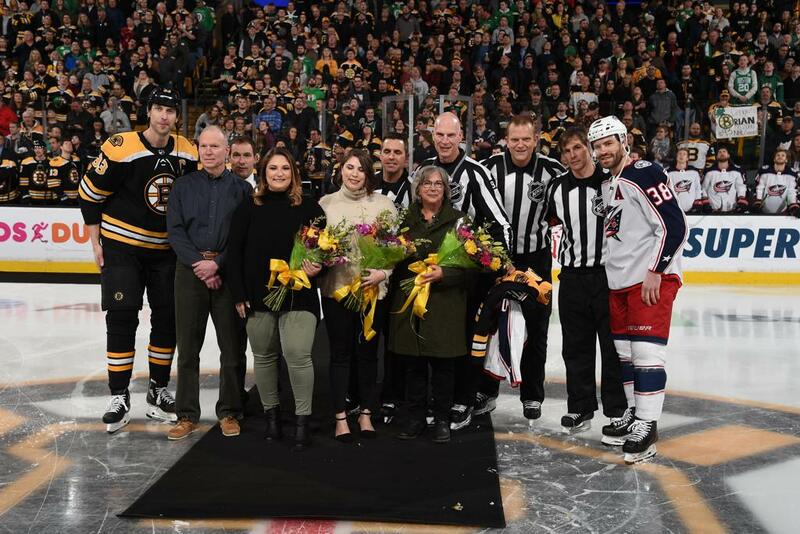 Murphy’s milestone came March 16, when he was one of the two linesmen as the Boston Bruins hosted the Columbus Blue Jackets at TD Garden, just an hour south of Dover. Family and friends were on hand for the momentous occasion, which included a pregame ceremony. While Murphy has become one of the most respected officials in the game today, the 54-year-old is all about remembering his roots and how he got to this point. Murphy was in college at the University of New Hampshire and driving the Zamboni at his hometown rink when he figured out that he could make more money officiating games instead of resurfacing the ice. “I was a business major. It didn’t take me long to figure that out,” Murphy said with a laugh. Eventually, his high school coach, Dan Rapasa, who was also a college official in the Hockey East Association, urged Murphy to look at higher levels and got him involved with USA Hockey. Murphy said he likely gained notice at the 1986 Olympic Festival in Houston, then was invited to an NHL officials training camp. He wasn’t hired by the NHL until 1988 — first as a minor-league linesman — and made his debut on the big stage Oct. 7 of that year when he called a Pittsburgh Penguins-Washington Capitals game. He became a full-time linesman in 1990. His 2,000th game marked the 1,912th in which he was a linesman. He tried out being a referee for 88 games when the NHL first experimented with the two-referee system, but went back to being a linesman. During his three-decade career, Murphy has also conducted camps that have groomed many others in their pursuit of becoming an NHL official. 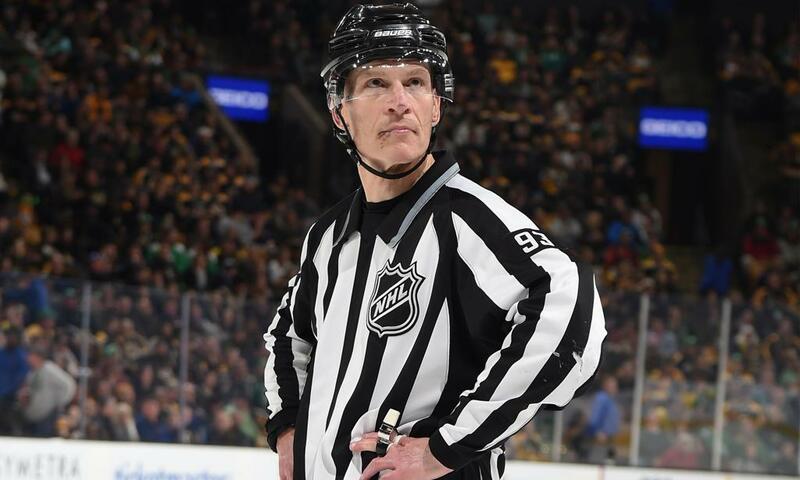 In fact, during his 2,000th game, Murphy picked the other three officials on the ice with him and he chose Tim Nowak as the other linesman and and Chris Rooney and Wes McCauley as the two referees. Nowak and Rooney attended Murphy’s camps in the early 1990s and McCauley’s dad, John, scouted Murphy at the 1988 Olympic Festival. It is just one of the ways Murphy likes to give back. He keeps in communication with many of the former campers as they continue their development, and he scours box scores of college games and international tournaments to see if there is a familiar name. Murphy knows he is late in the final period of his officiating career. To get ready for whatever happens next, he earned his masters in business administration from Southern New Hampshire University last year. He would like to continue to develop young officials and possibly work with USA Hockey whenever he decides to stop blowing his whistle during NHL games. He hopes the example he has set throughout his career rubs off on those watching him.